I’m delighted to announce that I have another short story coming out this year. 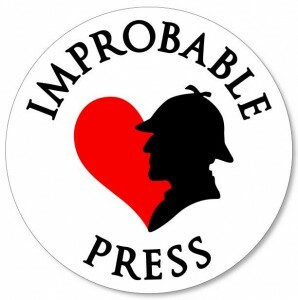 What’s more, it’s in a Sherlock Holmes anthology that is raising funds for a school housed in Arthur Conan Doyle’s old home, Undershaw. The anthology is edited by well-known Holmesian writer, David Marcum, and its contributors include Wendy C. Fries (author of The Day They Met), Denis O. Smith and James Lovegrove, with forwards by Jonathan Kellerman and Steve Emecz, among others. There are plenty of options, including a PDF, a paperback or a hardcover copy of the book. You can even back it by getting Volumes 1-5 as a paperback or hardback set. The mantelpiece was as cluttered as ever with pipes and the Persian slipper, a few stray plugs of tobacco held against his morning smoke, unopened correspondence, the clock, a collection of curved wooden shapes of obscure function, and a retort containing pale yellow fluid sitting in a cradle – some half completed or completely forgotten experiment, no doubt. The morocco case was thankfully not to be seen. An engaging case, then. Sitting among all of this habitual detritus were five Christmas cards, each depicting scenes of a macabre humour. A frog that had stabbed its fellow, two naked-plucked geese with a man on a roasting spit, a wasp chasing two children with the unlikely subtitle A Joyous New Year, a savage white bear crushing an explorer in A Hearty Welcome, and a dead robin which read May yours be a joyful Christmas. The latter at least hearkened to the Christ story, the rest to a certain black wit about Holmes’s profession. It seemed likely to me that one card had been sent by Lestrade, others by Gregson or Jones. I took up the card depicting the frog-murder but found it inscribed merely with To my dear friend at the top and Mrs Inke Pullitts underneath. The script was disorderly, as though done in haste, and struck me as more a masculine than a feminine hand. I was startled out of my examination when the door flew open and Sherlock Holmes strode through it, a dozen newspapers under his arm. He abandoned the papers over the arm of his chair. His pale cheeks were rosy with the cold he’d just escaped, and his grey eyes sparkled with the merriment I had long associated with an intriguing case. Holmes placed two glasses on the table and fetched five envelopes from beneath a book on folklore. The topmost he gave to me. I examined it closely – it was addressed in the same untidy hand as the card to the attention of Mr S Holmes, though scrawled so untidily as to appear to read ‘Mrs Hulmes’. The paper was inexpensive, matching the quality of the card, and bore no return address. The corner of the envelope was marked, fore and aft, with a peculiar indentation, as though it had contained something other than the greeting. I saw a similar mark upon the matching card. I sniffed the paper, as I had seen Holmes do in his investigations, but it told me nothing and made me feel foolish. I couldn’t bring myself to dab the tip of my tongue to the paper, another of Holmes’s investigative techniques.